While I am so excited to enjoy Halloween with my daughters, I am also concerned with the slew of candy that they are going to be bombarded with. Dr. Jennifer Salzer, a dentist, orthodontist and mother of four, recently shared some tips with Momtrends on how to develop a good oral care regimen including proper brushing, flossing habits and regular dental checkups that can help our children establish positive lifestyle habits to help build a lifetime of confidence, while also preventing tooth decay and gum disease. There&apos;s nothing like adding a new toothbrush into the Halloween swag. Get one of your child&apos;s favorite characters, like this Wonder Woman toothbrush. Is There Such a Thing as &apos;Good Candy&apos;? Gummy candies and taffy are more likely to lead to tooth decay, particularly when they get stuck in-between teeth making it difficult for saliva to wash away. Try sticking to sugar-free lollipops and hard candies - these treats stimulate saliva helping to prevent dry mouth. A dry mouth allows plaque to build up on teeth faster, leading to an increased risk of decay and cavities. It&apos;s key to make sure they don&apos;t snack on it over a long period of time. It&apos;s better to let them eat whatever pieces they select and then get busy brushing! And for some ideas on non-candy treats, check out this post on delicious healthy Halloween treats. 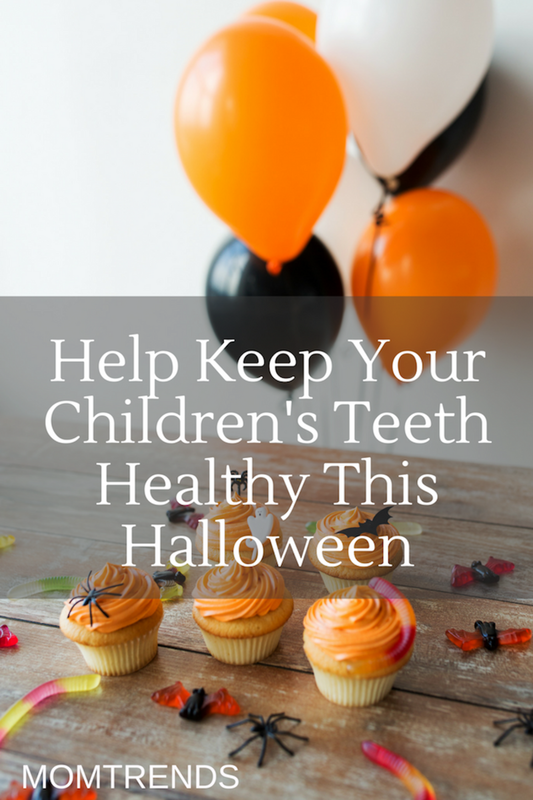 If you and your children can&apos;t brush your teeth immediately after eating or enjoying their trick-or-treats, rinse your mouths thoroughly with water to help prevent tooth decay. If you choose bottled water, check the label for fluoride content. According to the American Dental Association, fluoridated water can reduce the number of cavities children get in their baby teeth. Call in the Expert: Get started on the right foot and make sure you see your child&apos;? ?s dentist early. Parents should schedule a checkup with the dentist for their baby at their pediatrician&apos;s recommendation. A good rule of thumb is: first visit by first birthday. Lead by Example: Kids typically want to start taking over brushing around 2 years old. A great way to transition the brushing responsibility is to have them let you brush their teeth first, and then hand over the brush to let them practice. This way you can be confident that everything is still being brushed properly. Once they are able to take over completely, it is a good idea to encourage your kids to brush in front of a mirror; this will help them see spots they may otherwise miss. Food for Thought: For children 2 and older, parents need to be aware of the impact that nutrition and eating/drinking habits have on oral and overall health. Make sure your child is eating a healthy breakfast every morning and limit snacking of unhealthy foods or sugary drinks throughout the day. Offer Choices: Have plenty of oral care supplies on hand for your kids, and make sure they are in the flavors and designs they&apos;ll be excited to use. A unique toothbrush and toothpaste will encourage proper oral hygiene without any extra prodding from you and will help them face school with a confident smile! My top pick is the Oral-B® Stages line which features products designed for kids 4 months to 7 years of age. It provides appealing options for young children with fun Disney® characters and designs including the newest addition, Jake and the Neverland Pirates. Additionally, the toothpastes for ages 2 and up are available in flavor options that kids love. No Use Crying Over Lost Teeth: Kindergarten brings a lot of firsts for many children: first bus ride, first teacher and often, their first lost tooth. Children five and up begin to get their permanent molars, and it&apos;s important to pick a brush that reaches those back teeth while staying sensitive to tender areas.